Product managers have unique experiences and competencies that equip them for senior leadership roles. Many CEOs come from a product management background, including the last 8 CEOs of Proctor & Gamble. But, what should the product manager turned senior leader (or one who is planning on being a leader in the future) do to help his or her organization be more successful, and just as importantly, be the type of organization where people are motivated and want to work? Well, that is the topic of this episode. 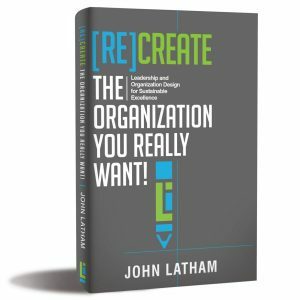 My guest is John Latham who is sharing insights from his latest book, [Re]Create the Organization You Really Want. This is a book I have been encouraging John to write for several years, and I am delighted he has. You see, John has a rare combination of having performed research with leaders of world-renown organizations that moved from being good organizations to being the very best in their industry. He also has decades of experience helping organizations reach higher levels of performance. In the discussion, you’ll hear why product managers are suited to be organizational designers — treating the organization as a product to improve. What led to the creation of [Re]Create the Organization You Really Want? The book presents a definition of what it means to be a great organization and provides the framework for creating a great organization. Great organizations create financial results while creating value for all stakeholders, including customers, suppliers, workforce, community, and the natural environment. Being great means creating financial results in a way that also creates value for these stakeholders, resulting in a sustainable organization. The book is a culmination of 30 years of professional practice helping organizations be great and research into such organizations. The catalyst for the book was research of CEOs who had successfully recreated their organizations to win the Baldrige Award. This research, combined with other research and professional experience, led to the frameworks presented in the book, providing a roadmap for leaders to create great organizations. Why are organization design and leading transformation an important topic now? The short answer is we have tried everything else, and we are still struggling to make organizations that perform at their full potential. Organization design is the alignment of four cornerstones: (1) stakeholders, (2) strategy, (3) systems, and (4) scorecard. These cornerstones are held together by a supporting organizational culture. It’s an important topic today because the pace of change is increasing along with the increasing complexity of business environments. What challenges do product managers face in becoming organization designers? Product managers are ideally suited to take on the challenge of designing the organization. They understand the organizational system better than those working in isolated functional silos. Also, they are accustomed to working with products that create value for customers and thinking about how to design in a value-creation manner. Yet, they face three big challenges. First, is taking a dynamic system’s perspective to the overall organization. It is not something that is taught in business schools. Second, is a product manager’s ego. Collaboration is essential to organization design, and collaboration is something that product managers tend to have experience with, but it is all-to-easy for the ego to get in the way and we all need to be aware of this. The third is curiosity. While product managers may be curious about meeting customers’ needs and wants, they need to develop curiosity for improving the organization also – such as conducting experiments to see what works and what doesn’t. Other issues involve the tenacity to keep learning about your organization, testing design options, and implementing what works. Organization design is a continuous process. What are the benefits of improved organization design? Leaders spend too much time putting out fires. A well-designed organization will free-up time for leaders as they will have fewer fires/issues to address. So, a key benefit is creating more time for leaders to be working on their business instead of in their business. Another benefit is avoiding boom/bust cycles by creating more sustainable growth. Also, many organizations exist at the expense of one or more stakeholder group. For example, organizations with a work environment that doesn’t fully engage employees, resulting in lower performance. Neglecting one or more stakeholder groups may work for a time, but it is not sustainable for the long term. Improved organization design can create sustained performance that is an economic engine you are excited to be a part of. It results in organizations were you whereto work. John’s book, [Re]Create the Organization You Really Want. The Organization Design Studio – free and paid resources to help you [re]design your organization.